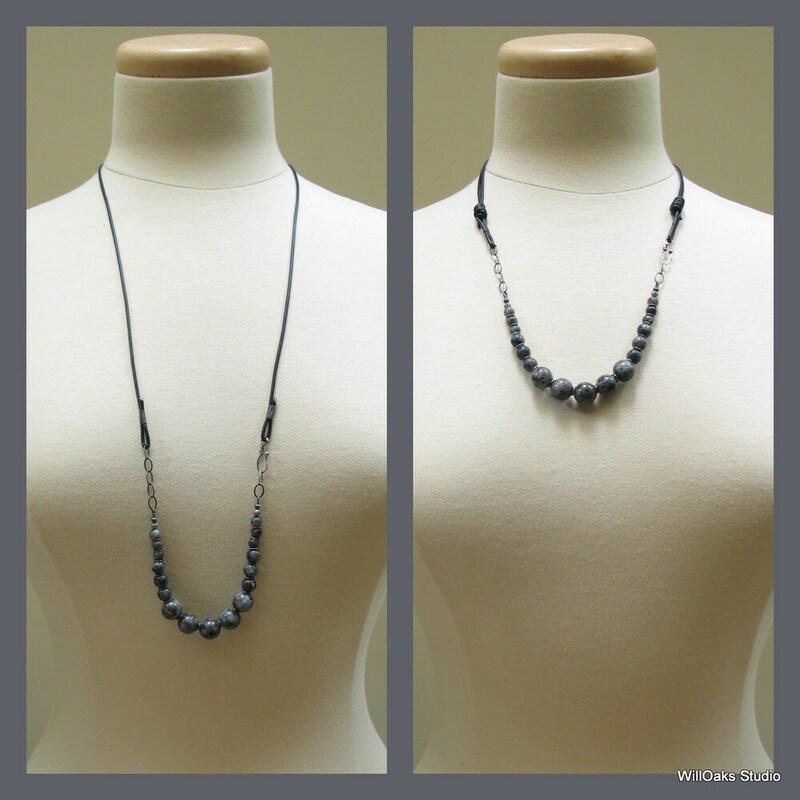 Add a contemporary leather and labradorite beaded necklace to your collection to cross seasons and to complement many necklines. 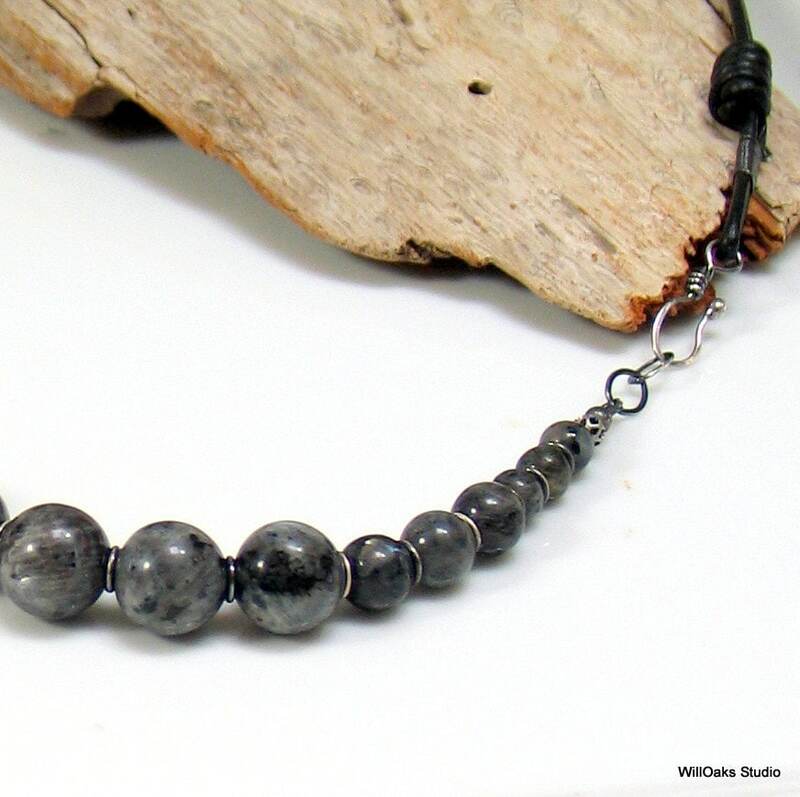 Beautiful dark larvikite, a very dark labradorite with blues, blacks and greys plus flashes of color, is graduated beads 12mm, 8mm and 6mm. Oxidized sterling spacers peek from between each bead. 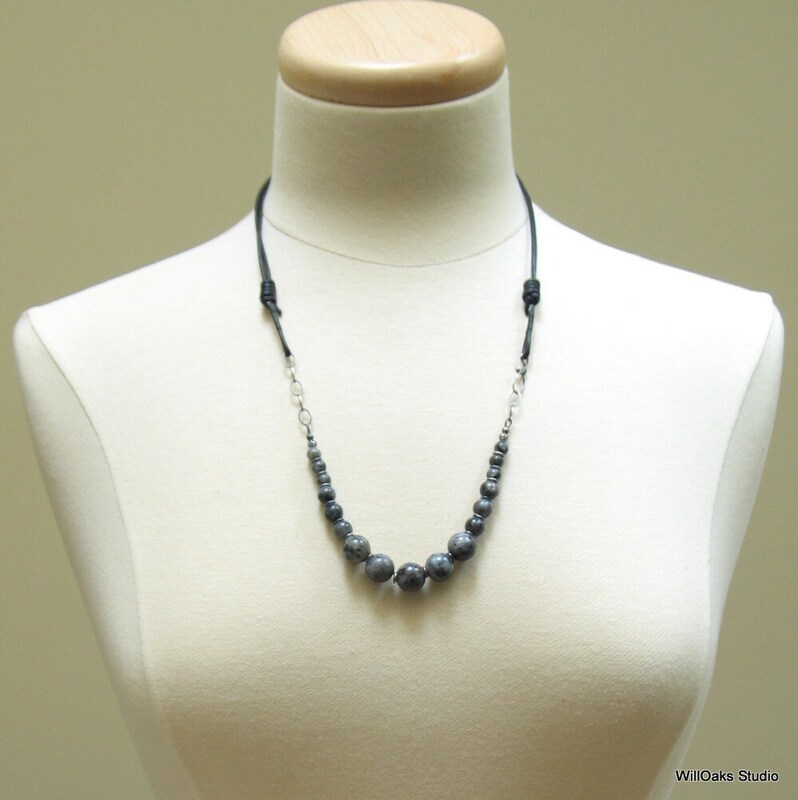 The graduated gemstone focal is connected to oxidized sterling chain and the clasp, which is a hand formed sterling hook. Total length of this focal is about 8.5". 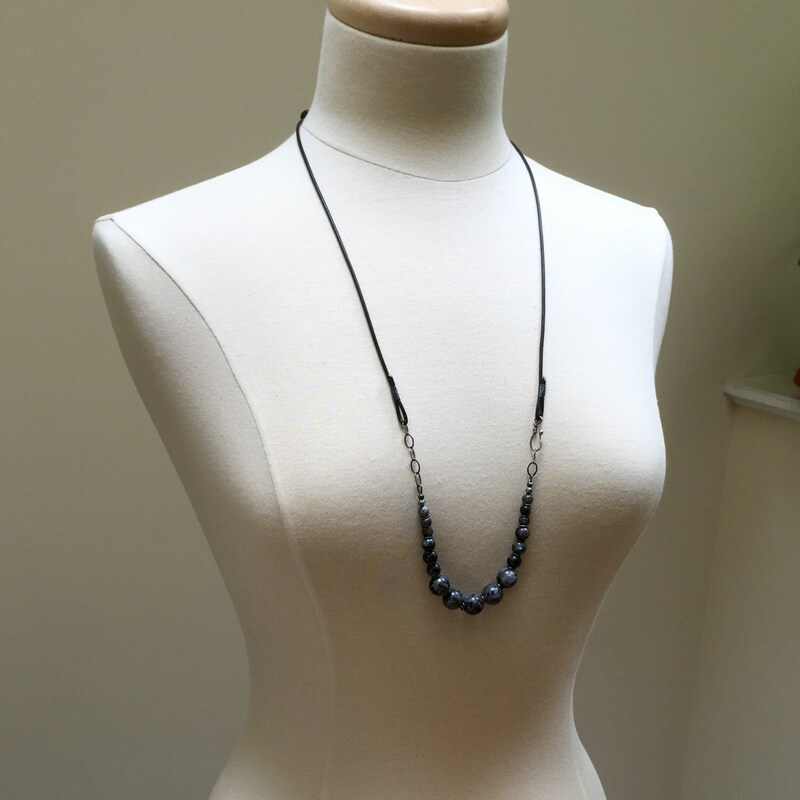 Black leather with slip knots lets you wear this beauty from 24" to 36"--so versatile--even as you open and close it with a hook and eye in front. Sweet little details include oxidized sterling silver "accu-guard" terminators at the ends of the flexible cable where it connects to the chain (protects from wear), oxidized sterling crimp covers that blend with the sterling beads that bracket the gemstone beads, and a small perforated metal bead finished in a gunmetal gray to add a touch of texture. Perfect for casual wear and since it's dark and neutral, it will be a go-to piece for lots of outfits. Easy to adjust, and with the hook in front, easy to put on and take off, too. Coordinated drop earrings are also available featuring oxidized sterling and larger Lakravite beads. 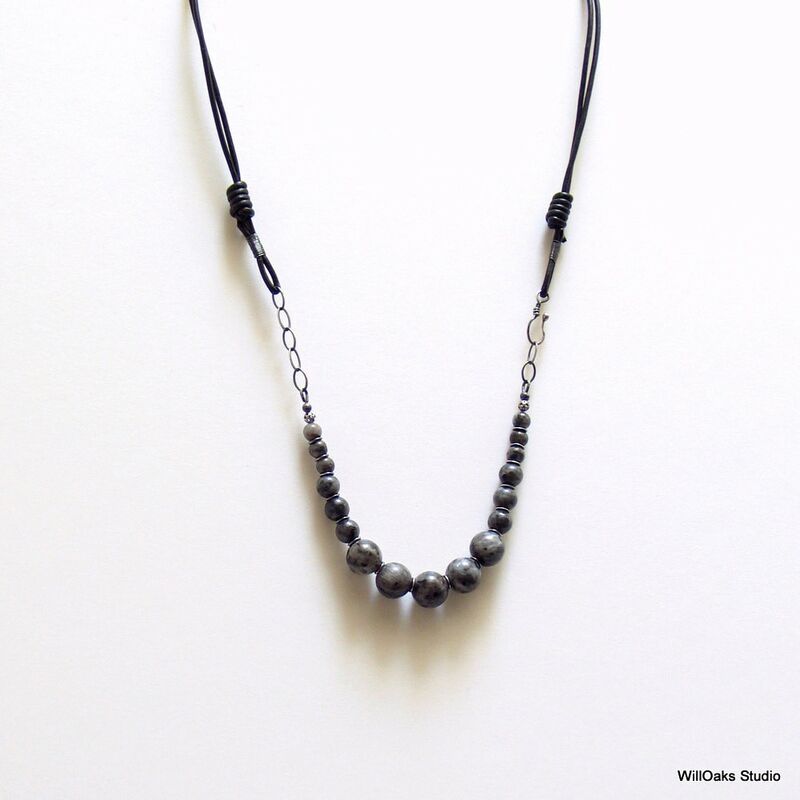 A limited edition and each necklace is made to order, so it is possible to make some adjustments to leather lengths and to substitute a different color of leather for black. I can change the metal parts from oxidized sterling to bright sterling silver. Please contact me directly if you're interested in any of these custom changes and a custom listing will be developed for you. Comes in my signature box, ready to gift or to enjoy. Beautiful necklace! This artisan creates unique jewelry!